The captivating luster and classic beauty of pearls can make any piece of fine jewelry shine, but these natural beauties require special care. Proper storage and cleaning are essential, and there are certain products and environmental conditions you'll need to avoid in order to keep your pearl jewelry looking gorgeous for years to come. Don't wear pearls when cooking. Oils and acids from your skin, as well as beauty products and environmental chemicals, can dull the beauty of your pearls over time. Because these gems are soft and fragile, they are also particulalrly vulnerable to scratching and other surface damage. Knowing how to take care of pearl jewelry can preserve its beauty. Because they are a natural, organic material, pearls don't stand up well to exposure to chemicals. Never wear your pearl jewelry while cleaning your house, as common household cleansers will damage the delicate surface of the gems. Be particularly cautious about any product that has abrasive properties or uses acid to clean. Even window cleaner can be devastating if it comes in contact with your pearl jewelry. It's also a good idea to take off your pearls when you're cooking. Acids like lemon juice and vinegar will eat into the nacre, or irridescent outer layer, of the pearls. Grease and heat can permanently stain their surface as well. Don't put the pearls back on until after you've cleaned up the kitchen, too. Certain dish soaps, especially those with lemon, will also damage your jewelry. Additionally, beauty products, like makeup, hairspray, and perfume, can also cause harm your jewelry. Always apply these products before putting on your pearls, and if possible, avoid wearing them in the same area as your jewelry. For instance, if you plan to wear a pearl necklace but will also be wearing perfume, apply the perfume to your wrists only. Then wash your hands before putting on your pearl necklace. Pearls are formed in water, and if they become too dry, they are damaged. Dry heat, like that from a hair dryer or curling iron, can actually cause brown spots and even cracking. 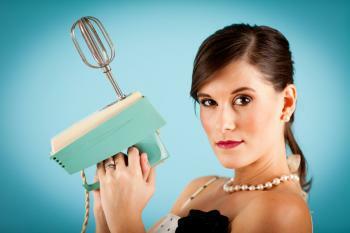 If you use heat to style your hair, always complete your beauty regimen before putting on your pearl jewelry. Too much moisture can also damage your pearl jewelry. Water can damage the stringing material in a pearl strand, leading to breakage. 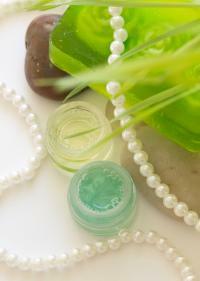 Chemicals in shampoo and soap can dull the pearls' luster. The chlorine in swimming pools can also cause pitting in the surface of the pearls. Always take off your pearl jewelry before getting into the bathtub, shower, or pool. When you wear your pearl jewelry, it's important to avoid clothing that may abrade the surface of the gems. Rough wool, sequins, beading, metalic threads, and other materials can actually scratch your pearls, eventually dulling the surface. Wear your jewelry with softer fabrics to keep it looking beautiful. Every time you wear a pearl necklace or bracelet, check the condition of the stringing material. If it appears worn or damaged in any way, have the pearls professionally restrung. If you wear your pearls often, you may need to have them restrung about once a year. If your pearls are in a precious metal setting, make sure the prongs are secure. If they seem loose, take the piece to a jeweler for tightening. Store pearls in a separate bag. When you're ready to take off your pearl jewelry, there are a few things you should do. 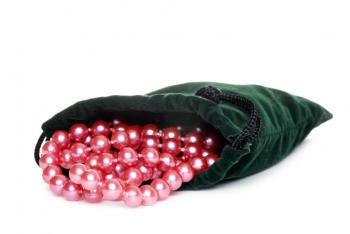 Storing your pearls properly will help ensure that they're just as lovely the next time you want to wear them. Keep these tips in mind. No matter how careful you are about beauty products and household chemicals, your pearls will still need a light cleaning after each use. The oils from your skin, as well as your perpsiration, can damage the nacre if they are left on the pearls. Simply use a soft cloth, such as a glasses cleaning chamois, to wipe down the surface of your pearls in your jewelry. Because they are so soft, pearls are easily scratched by other items in your jewelry box. While it may be tempting just to toss the pearls in on top of everything else, take a moment to slip your pearl jewelry into a soft velvet bag. Even better, keep pearl pieces in separate lined boxes. Hanging may seem like a great way to store pearl jewelry, but it actually weakens the stringing material. After time, this can result in breakage. Always store your pearls flat to prevent this type of damage. No matter how well you take care of your pearl jewelry, you'll find that you sometimes need to clean your pieces. When done properly, cleaning can actually extend the life of your pearls. Keep these guidelines in mind. Many pieces of pearl jewelry mix a number of materials together. For instance, you may have a pearl ring with a gold setting. The gold in this piece are far more durable than the pearls. If the jewelry has even one pearl in it, let that pearl dictate the methods and products you use to care for the piece. Don't use jewelry cleaners designed for diamonds, silver, gold, or any other materials. Instead, choose a product that's designed specifically for pearls, such as Blitz Delicate Gem and Pearl Cleaner. Never use a steam cleaning or ultrasonic cleaning system for pearl jewelry. No matter how dirty your pearls are, never use a brush or abrasive cloth to clean them. These materials will scratch the pearl's surface, removing the nacre along with the dirt. Knowing how to take care of pearl jewelry is the first step in making your treasures last a lifetime. With proper care and cleaning, your pearls will be lusterous and captivating for decades to come.